/General /Why does support expire? In September 2015 Envato introduced a new way support gets handled. All items purchased after the 1st of September 2015 are under these new terms and authors have to apply to them. With every purchase on the Envato Marketplaces you get 6 months support included. 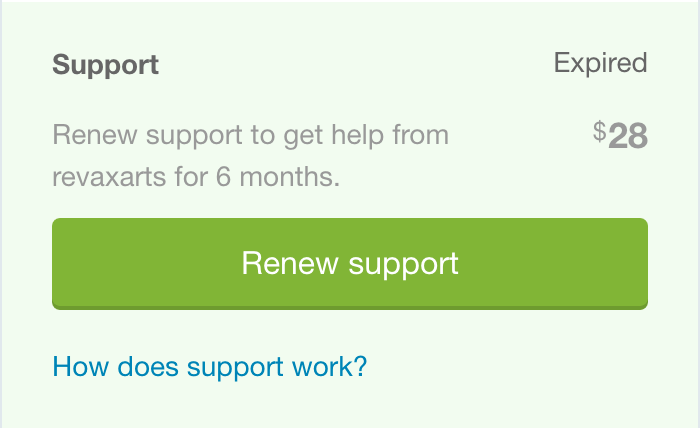 How can I renew my Support? You can extend your support period on the item page of the product. Does my support request get answered if my support for the item has expired? If you have submitted the ticket after 1st of June 2016 a response is not guaranteed. Does I lose the right to answer a ticket if my support has expired? You can reply to your ticket up to 14 days after your license expired. New tickets can’t be created if the license is expired. You can check out the item support policy on the marketplace.